However, Moka pot is sometimes associated with a bitter taste, and perhaps dirtiness in the resulting cup, but rather than blaming it fully on the brewing device, it can be the issue of the coffee that was brewed with it. Here, in CoffeeClick, we decided to go step-by-step through the brewing process, giving you some preparation tips for a tasty brew. Choose quality coffee. If you are using freshly roasted coffee beans, they should be grounded only just before brewing, to retain as much of the coffee’s aromas and flavours. Check out our full range of coffee beans. Use coarse grind. The grounds shouldn’t form big lumps and boulders, but rather sit in the filter basket evenly. No need to press the ground coffee into the basket. We recommend the Lavazza Gran Filtro 226g and Gran Filtro Italian Roast 226g for Moka Pot brewing. The water you fill your Moka pot with should be always preheated, to shorten the amount of time your coffee is sitting on the stove. If it sits there, warming up in the chamber, then the drink will taste burnt. Hot water inside will help you brew the coffee almost immediately. Get just the flavours that are desirable. This brewing method is a fast one, and you will need to keep an eye on it. Once the water is boiling, it creates pressure in the bottom chamber, and the water rises through the ground coffee in the basket, filtering through the sieve into the top chamber. You can see this happening as the first bits of coffee come out quite foamy, from the narrow neck inside the chamber. Once your brew gets to its end, it starts releasing crackling and bubbling noises, this is a sign that there is no water left in the bottom. We advise you to take brew of the stove immediately, and even cool it down with a wet towel. This helps to stop the brewing process—the pressure rising through the filter. The coffee is ready to be served straight away. The best is to pour it into cups and enjoy! Like with any other coffee machine and brewing device, cleanliness is essential for preserving the brewers, and for producing continuously tasty coffees. One of the biggest myths we have heard about the Moka pot is definitely the rule not to clean it too much, but rather ‘season it’ with the coffee oils. In our experience, the more residue you have, the more burnt and dirty the coffee will taste. 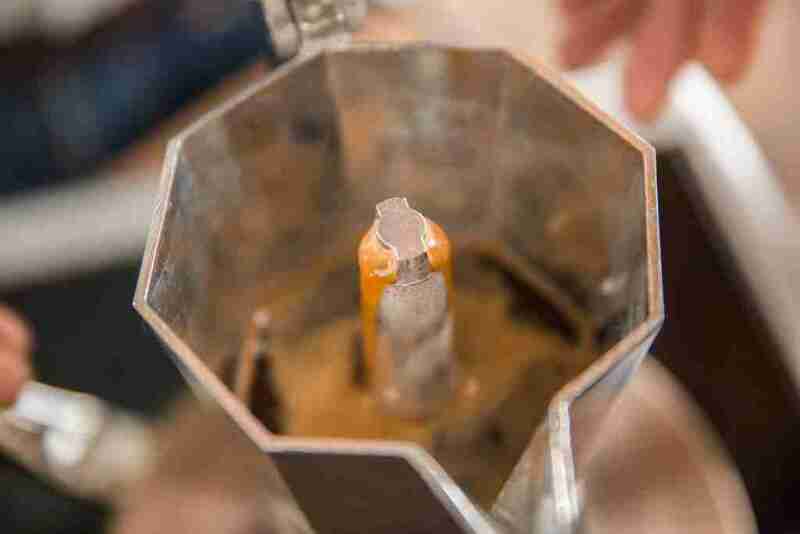 How to keep your Moka pot clean? Don’t worry, you can clean your Moka pot after you’ve enjoyed your morning cup, and it won’t even take you too long! 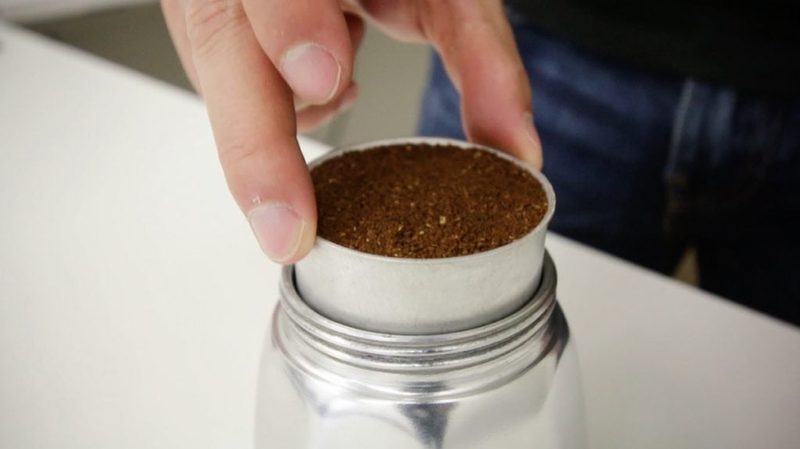 Throw away the ground coffee and clean the basket, as well as the bottom chamber after every use. There should be no obvious stains or dirt left behind. After every brew, you should also take the rubber seal out and clean the filter in the top chamber. It may surprise you how much dirt there is left in this part of the brewer. To descale your brewing equipment, just use citric acid powder, or simply lemon juice, and brew some water with it in the Moka pot, as you would with coffee. Then rinse and dry everything. Keeping to these simple steps will help you prepare a delicious cup with this traditional method. A coffee that you can appreciate together with the rest of your family. Check out our full range of Moka Pot here. And if you have any further questions on Moka pot, please email our coffee experts at customerservice@coffeeclick.ie.